What does Coin Silver mean in relation to vintage Native American jewelry ? Silver is 99.9% pure elemental silver. Sterling Silver is 92.5% silver and 7.5% other metals, usually copper. The stamp .925 indicates that at item is 925 parts silver out of 1000 parts, the remaining 75 parts are usually copper but can be other metals. 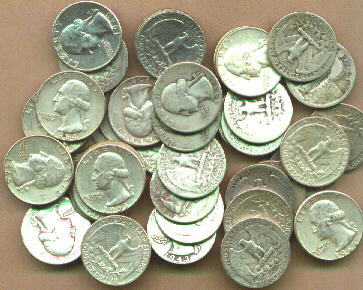 In the US, the coin silver standard was established in the 1820s to be 90% silver and 10% copper and all dimes, quarters, half dollars and dollars until the end of 1964 were made of those metals. 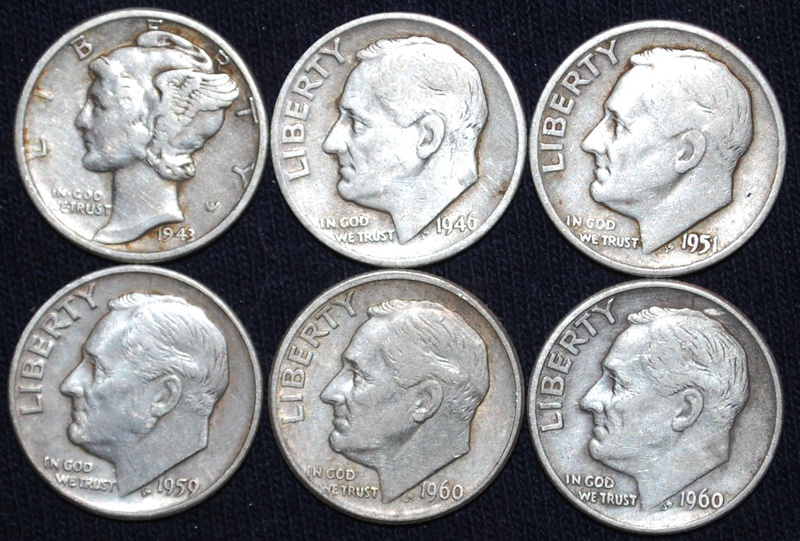 Coin Silver, when used in association with vintage Native American jewelry, is a term used to refer to the alloy that resulted when pre-1965 US silver coins were melted down to reuse in jewelry making. Coin silver made from US coins has less silver than sterling silver (90% compared to 92.5% in sterling silver) but that doesn’t necessarily make coin silver jewelry less desirable. In fact, because coin silver jewelry is usually older and hand hammered, it might be more valuable than if it were made of sterling silver. Vintage Mexican coins often had a silver content above that of US coins, therefore was softer and easier to hand hammer and preferred by some old-time silversmiths. Some Mexican coin silver jewelry will test as high as sterling silver. Early Native American craftsmen made jewelry directly from the coins, heating the coins in a fire pit or forge and hammering them into shape. Items like this often have some faint residual impressions from the coin design remaining. They also made ingots by melting coins and pouring the liquid metal into molds to form ingots (blocks or bars). They then would hand forge, or hammer, an ingot into the shape of a bracelet or other item. It should be noted that some vintage ingots are “blends”, that is mostly Mexican coins with a few US coins thrown in OR mostly sterling silver with a few US coins thrown in or any variation thereof. That’s why the exact silver content will vary widely in the vintage jewelry. 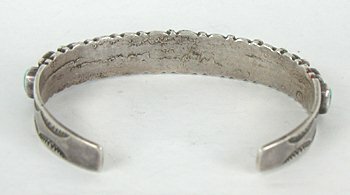 This 1930’s bracelet was hand forged and tests at least as high as sterling silver, so is one of those “blends”. Pure silver is generally too soft for jewelry making, so it is combined (alloyed) with other metals. Sterling Silver: Sterling silver and is stamped as “sterling” or “.925” which indicates that it is 92.5 percent pure silver. By law sterling silver must contain no less than 92.5% fine silver with the remainder being any other metal. The other 7.5 percent of the material is comprised of alloys, usually copper (which is what causes sterling silver to tarnish). Mexican Silver: Mexican silver is usually 95% Silver and 5% Copper. After World War II, for jewelry and objects made in Taxco, Mexico, the Mexican government issued an assay mark guaranteeing the purity to be 925 or higher. This mark is referred to as the “spread eagle” mark. The original mark did look like an eagle, but with modifications over the years, the mark was simplified. The number inside the mark is a workshop or city designation. In 1979, this mark was abandoned in favor of a series of registry letters and numbers assigned to individuals and workshops. Mexican silver is softer so can bends more easily than sterling silver…….which can be either a good or a bad thing. Argentium® Sterling Silver: A registered and patented alloy of sterling silver, copper and a small amount of the element germanium, developed in 1984. This alloy has excellent tarnish resistance and requires minimal maintainance to remain looking like new. This phenomenon is a result of a transparant layer of germanium oxide thats forms on the surface of the metal and slows the formation of silver sulphide, or tarnish. Tarnish is formed when sulfur reacts with the copper in sterling silver to form silver sulphide. This sulfur can come from the air, perfume, deodorant or skin, among other sources. An occasional wash and rinse and/or wipe with a soft cotton cloth is all that’s needed to keep an object made from Argentium Sterling Silver in pristine condition. German Silver: It is not actually silver at all! Also called nickel silver, this popular alloy contains copper, zinc and nickel, but has no silver in it. Also sold under manufacturers’ trade names, this material is very hard and generally must be machined. Nickel Silver: See German Silver above. Silver Overlay : This can have several meanings. When used in high-end tack accents, belt buckles and so on, silver overlay is made by mechanically bonding a layer of sterling silver over a thicker base metal, usually nickel. This creates a metal with the qualities of sterling at a lower price. Sterling overlay should be thick enough to allow the silversmith to make his engraving cuts in the sterling layer without cutting through to the base metal below. But in Native American jewelry, silver overlay refers to 100% Sterling Silver, both layers are sterling silver. The top layer is cut out with a jeweler’s saw and placed on a solid sterling silver base. The Hopi Indians excel at Sterling Silver overlay. Silver plate: Silver plating is the least expensive method of utilizing silver in decorative work. To silver plate, a base metal is electrostatically charged, so that a very thin layer of silver adheres to the base. The silver is usually applied as a liquid and is at approximately 7 millionths of an inch thick. Silver plate cannot be hand engraved, but it’s often applied over design cuts made in the base metal.